I love nothing more then starting my day with some mindfulness, yoga and when it permits – epic views too. Yogasphere are known for putting on out of this world innovative mindful events, where not only do they deliver some of the best yoga sessions in town, but also plant 10 trees for every person who attends the class, this idea was actually born whilst the founder was having a yogi breakfast with Oprah in the Himalayas! 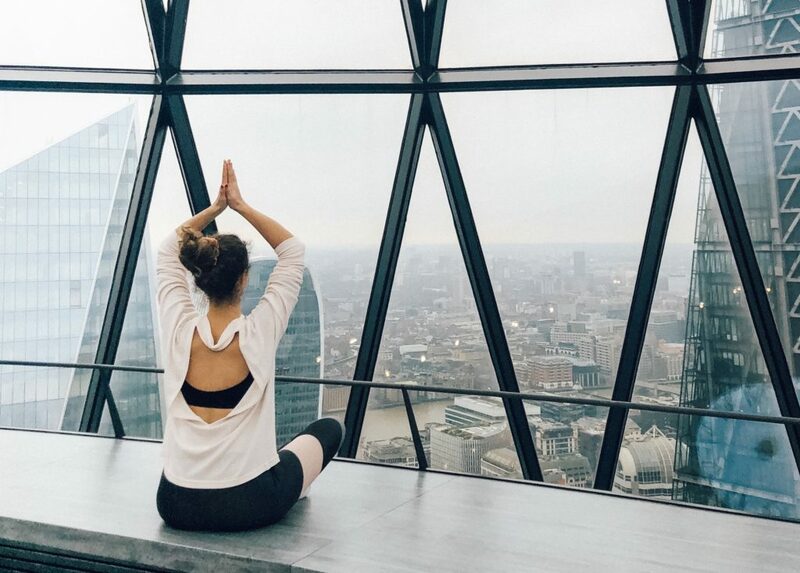 On a crispy, misty Saturday morning I made my way down to the Gherkin, an iconic building, with 360 views of London, where the Yogasphere event was being held. Many yoga enthusiasts like myself braved the cold and dark early London morning to enjoy one of the best possible starts to our weekend, with some sound healing led by Chai Francesco. The Vinyasa Flow was led by the founder of Yogasphere, Leo who was gentle, funny, and an experienced yogi and I really enjoyed his style of teaching, because he gave us a chance to flow freely and do some of our favourite asanas at one point of the class, to really make ourselves feel yummy and connected to our bodies, and allow us to do what we wanted. There is something so tranquil and calming doing yoga on rooftops for me, you quite literally feel on top of the world not only because of the views, but the post yoga zen feeling you get after it. It is one of the most nourishing practises I do for myself, as I always feel amazing afterwards. This class was followed by a sound healing session straight after led by Chai, which is always the icing on the cake especially post yoga, after you are feeling balanced and in harmony. Chai works with all of the instruments such as singing bowls, tuning forks, gongs and Native American drums. The sounds that are made in a sound healing session, really do ripple through your whole body, with a sense of cleansing and recharging. Sound healing is known to help with sleeping, depression, stress, digestive disorders and the list goes on..
You can’t expect nothing less then extraordinary events from Yogaspehere, and this was other one which they nailed. Thank you to Florence, Leo and Chai for allowing me to create space for myself, and do what fills my whole being and heart.